So when I last posted, I was having trouble with getting the #3 and #4 needles to fit without quite a bit of adjustment to the packing nut on the gun. Since then I’ve tried the following: new #3 needle sets from amazon and fuji, a new #4 set and a new xpc spray gun from fuji. I’m sad to say that nothing worked and the issue persists. Realistically, it probably won’t be a real world issue as everything I spray works perfectly with the #3 needle. 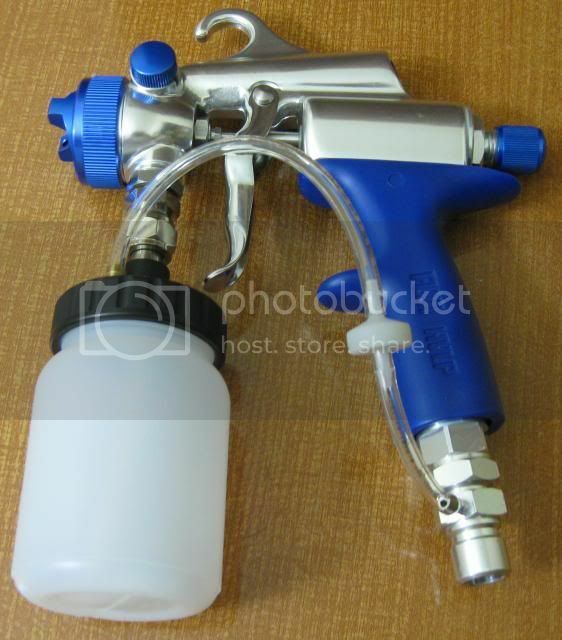 But I just feel there should be a bit more quality control for a spray gun that goes for $309. There’s one more thing I’ll try, and if it doesn’t work (I don’t see why it won’t) I’ll call it a wash and put everything through the paces. What I plan to do is chuck the #3 needle in my drill press with light pressure (since I don’t have a lathe) and use abrasives to take off a few thou so it matches the #4 needle in diameter. I’ll only do this on the shaft where it inserts into the packing, not the tip at all. I’m fairly confident I can accomplish this without much trouble. I’ll use some 600 grit and move up to 2000-4000 to polish it up. I’ll update how that goes; I might get out to the shop to try it later today. Once I can adjust the needle sets without mucking with the packing I’ll probably use the #4 set with my primer; it’s a higher solids water borne made by the same company that makes the clear coat I use (crystalac), so I get slightly better performance from the #4. 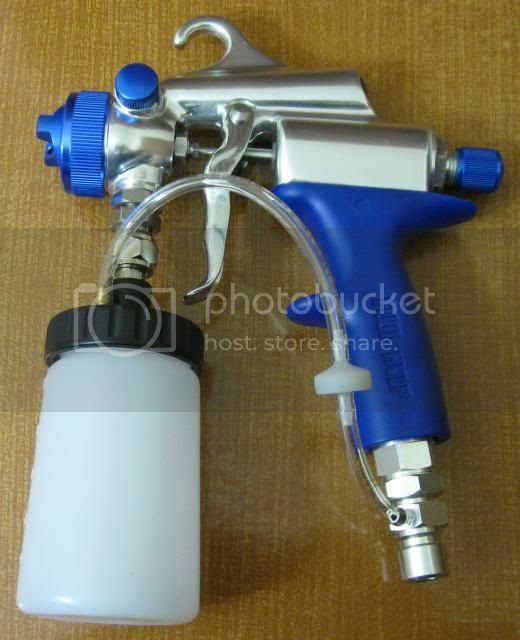 After reading up a bit on it, including a review from a well respected car painter/woodworker, and watching a few videos, I decided to order the Apollo 7500T Spray Gun. I didn’t need a cup for it as I already had the small plastic cup setup I bought for the fuji, which will fit the apollo. What I really like about the apollo, aside from the fact that it’s made in the USA, is that it can be converted to a bottom or top feed gun, bleeder or non bleeder, and compressor or turbine setup. Quite impressive. That shows up next tuesday so I’ll share my impressions then. 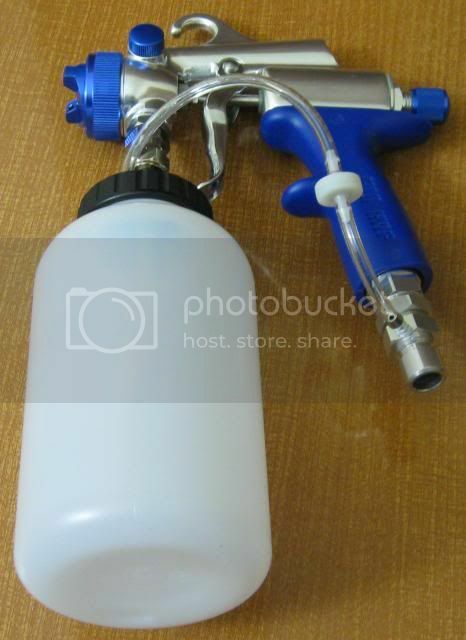 If the Apollo functions as well as I think it will, I’ll sell my fuji gun and get another Apollo, since I planned on buying another spray gun anyway. That’s it for the update; onto the tutorial! 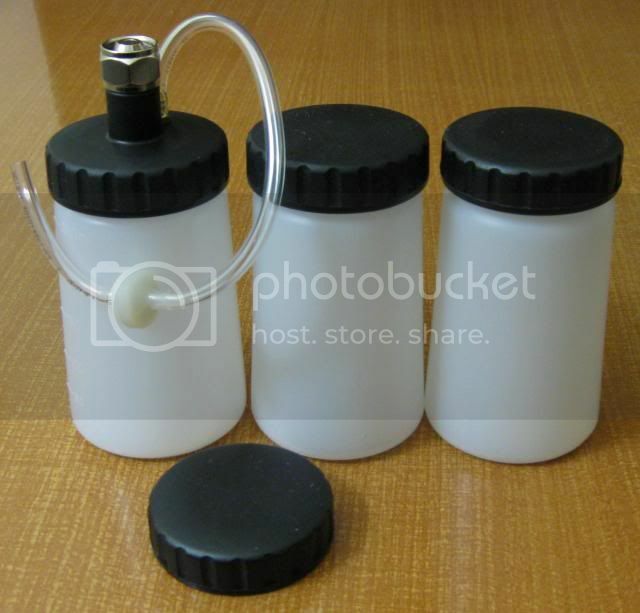 Since I spray small boxes/projects, I won’t need the quart pot too often. So I ordered the Mini-Cup Set. It’s a nice setup, but expensive; especially for spare jars. Looking at the lids that came with the cups, they seemed very similar in size to the lids for the plastic jars I store my finishes in. I tried one of the lids on my jars and the fit was perfect. No leaks or any other problems. 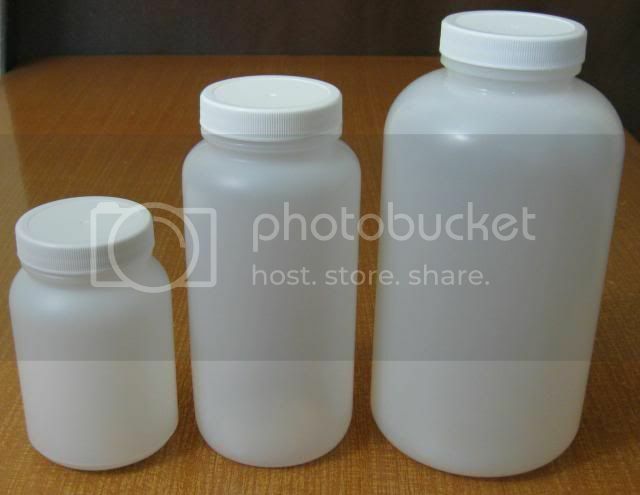 Since the only jars I have on hand were quart size, I went to the page on usplastic and see which other sizes used the same lids and saw that the 8.3, 16.6 and 32 oz jars all use the same lids. So I ordered some of each size and while waiting for those to arrive I went on to the next step. The jars fit, but I needed to get some tubing to replace the stock tubing that came with the cup set. From the writing on the tubing I know it’s 6mm I.D. x 8mm O.D. nylon, but not which type of nylon so I ordered a few different types from mcmaster-carr# (that place is amazing; always fast and cheap shipping and they have pretty much anything necessary for diy projects like this one). The tubing that works best was the vacuum rated type. 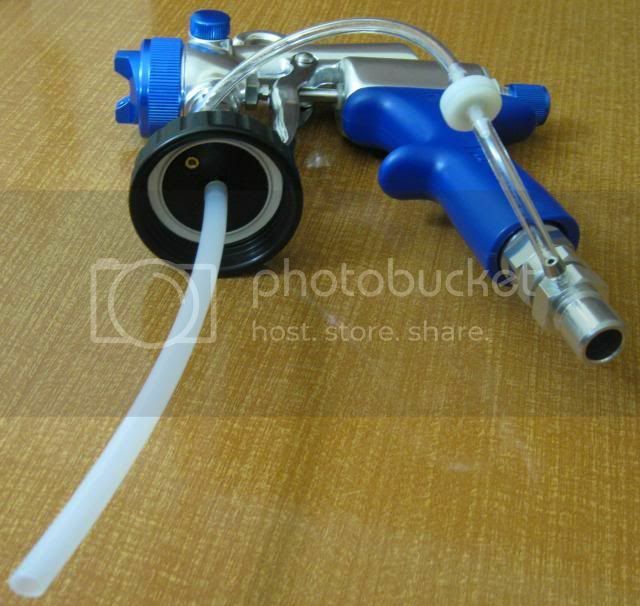 It matched the stock tubing in rigidity and slips on the fitting on the cup lid attached to the gun fairly easily. 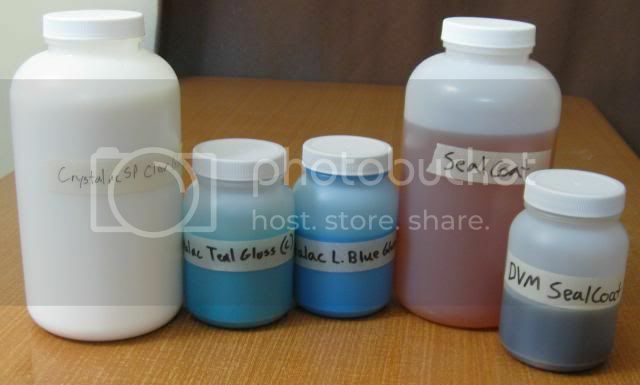 To be extra safe I did a solvent test with the solvents I use the most to see how it fared. I poured small cups of denatured alcohol, lacquer thinner and for an abuse test, acetone, and put cut-offs of the tubing I got from mcmaster in and left them for a few hours. When I checked, all samples were fine and unaffected by the solvents. 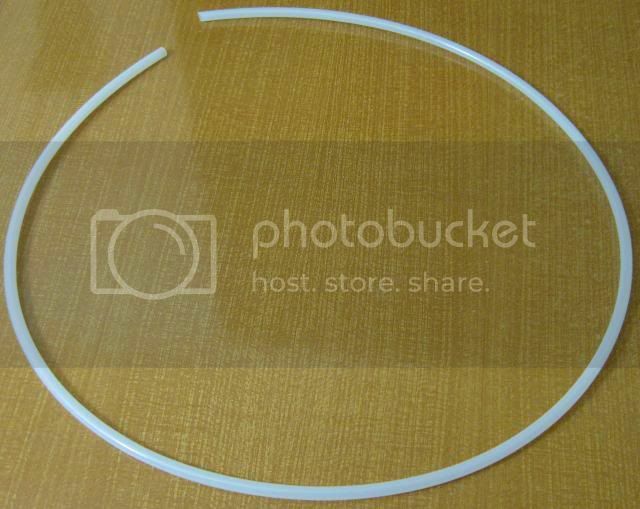 From there it was simple a matter of cutting the tubing to the right lengths. It cut easiest with a sharp utility knife. 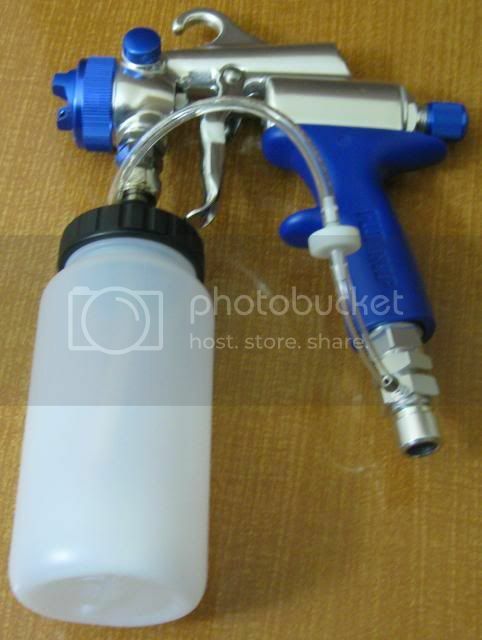 I made sure to have the tubing angled forward like on the metal cup setup, so when the gun is tipped forward for spraying things like tabletops, the gun will still be able to draw fluid from the cup. Also, when trimming, I took extra care to have the tubing as long as possible but not touch the bottom of the jars. I could have used the stock 8oz jars that came with the mini-cup set, but the 8.3oz jars from usplastic are a LOT cheaper, and on top of that, they’re shorter and wider than the stock cups, so they give the gun a more compact footprint and feel. I do wish the 16.6oz cups were a bit shorter and wider too, but they’ll work fine for medium sized projects. For larger projects, the 32oz cups work fine, though I’ll likely not use this setup too often. It’s nice to have the option available for bigger projects without changing to the metal cup though. The 8oz setup is the one I’ll use most often, so that’s the way the gun is set up now. If I were doing it again, I’d skip the mini-cup set and get just the single cup (mainly for the lid) and the jars from usplastic. The single cup is still pricey, but at least it saves a few bucks. My next post will have the results of the needle adjustment and finally some pics of the whole fuji system. You bought a whole new gun because you have to adjust the packing nut on this one? I was taught to loosen mine when I put the gun away for an extended period of time, so the Teflon doesn’t take a set. Also, I remove the packing nut as part of cleaning the gun block, so adjustment is something I understood I need to get used to doing. Is the XT for sale? I didn’t buy it because the packing needs adjustment; I bought it because I wanted a second gun. Originally I planned on buying another XPC gun but after watching some videos and reading reviews on the apollo I decided on that one. 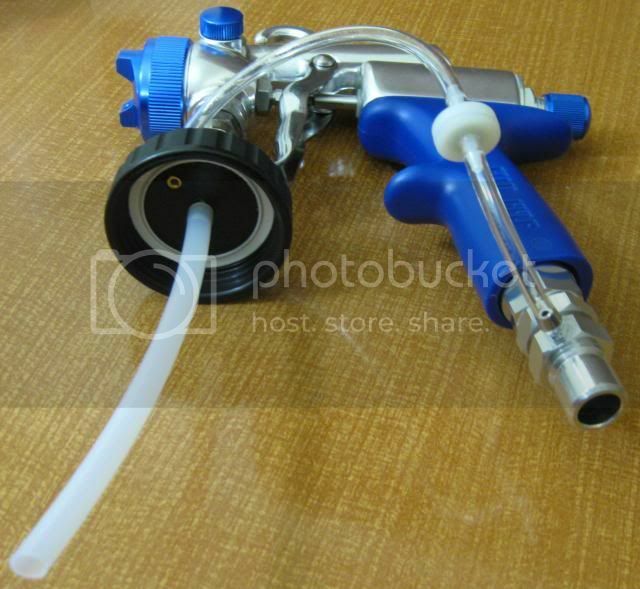 That’s the first I heard about loosening the packing when storing; I never did that with my compressor gun and it worked great for a year. I have removed it when deep cleaning. The packing adjustment isn’t new to me, I’m just not used to it from my compressor gun. That one came with 3 needle sets and the packing never required adjustment. Most likely the gun will be for sale; the apollo arrives on the 2nd, so I’ll know for sure then. Would you be interested? I might be interested. Please keep me in mind. The Apollo is a nice gun! One of the sources of backing the nut off for storage was a Binks manual. Binks ships new guns backed off, as well. Personally, I store my main gun without a needle or tip, as I don’t know which one I’ll need for the next use, and the gun is disassembled for cleaning. 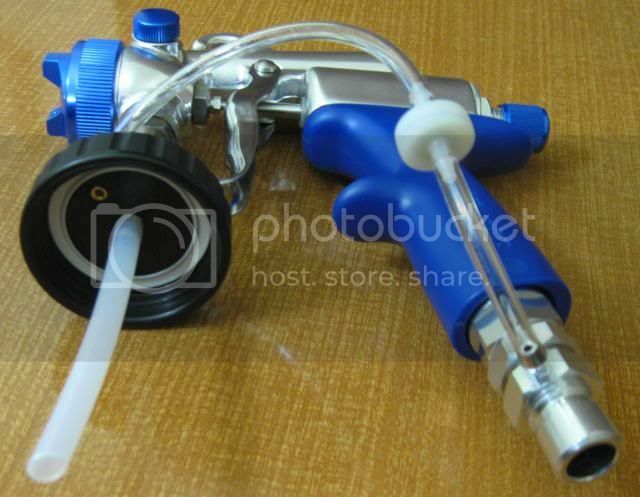 At different times, I’ll use my XT as both a gravity and suction feed, as well as with a 2 qt. pressure pot. With different configurations, the needle and tips can vary, even with the same material. Part of putting the tool together for use includes lubing and setting the packing tightness, so it never crossed my mind that some guns could go from setup to setup without changing the nut.